Let go, let God, and let grace go to work. If you're striving for God's favour, it's time for a fresh approach. Dwelling within, God's transforming grace is always working to set you free from self-centred living and rule keeping. 275 pages. Ever since Adam and Eve were escorted out of the garden, mankind has sought a way to regain God's acceptance-often through outward religion. But religion alone will never satisfy the human need for God's acceptance. Only by drinking deeply of grace can we find life that is simple, meaningful, and satisfying-a life in which we can find rest and cease our constant striving to be accepted, affirmed, and appreciated. 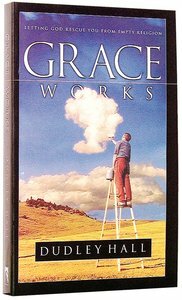 Dudley Hall, author and president of Successful Christian Living Ministries, points the way to meaningful existence in this new release of his powerful Grace Works. Do you long for God's acceptance? You have it! Move beyond outward religion and find your way to true spirituality, freedom from endless striving, and a grace-filled existence. Hall is the president of Successful Christian Living Ministries, a ministry dedicated to the restoration of the individual and the church to God's original plan. He is a popular conference speaker, is president of the Fellowship of Connected Churches and Ministries, and is an elder of the 1,500-member Restoration Church in Euless, Texas. He is a graduate of Samford University and Southwestern Baptist Theological Seminary. Customer Reviews For "Grace Works"
This book is a "must read" for every Christian finding themselves in an organised conservative religion going through the same ritual every Sunday hoping there is more to Christianity than that. It's for those who not just want to know "about" God but want to KNOW God personally and want to learn more about the loving promises He has for us, if only we knew who we are in God, and were entitled to ask. I love this book. I have read it twice and I'm buying more copies to give to friends. It is essentially about GRACE, a word and definition that surprisingly millions of Sunday churchgoing Christians know little about, as they have never been properly taught. The word says "my people perish through lack of knowledge". This book will certainly correct that! I would very highly recommend this easy to read book. You will not able to put it down once you open it.